Ahhh, Automakers. I see you did get that email. You know? The one where it is agreed that the focus in this first quarter of the year should be on inspiration in the commercials. Honda set things off right with the Civic commercial showcasing new innovations and emoting the feeling that things can always be better. Then, during the Super Bowl, we were treated to extremely long spots focusing more on the members of the military and cowboys than on the Jeep and Dodge trucks they were marketing. The fact that many count the Dodge commercial as their favorite says something – but what that is, we don’t yet know. It seems we’ve reached a trend where inspiration becomes the platform for awareness and connection with cars – and association is almost as strong as what’s under the hood. For those who remember Paul Harvey and loved listening to his radio broadcasts, the subject of his talk could have been about toothpicks and he would have made it inspirational. Play him talking about God making a farmer over beautiful images, and there might not have been a better connecting inspirational moment for its intended audience. The fact that it was effectively a two-minute slide show with voice over takes it to another level with its simplicity amid the pandemonium of the big bowl game. Going directly for the heart-strings, Jeep clocked in at 120 seconds with Oprah guiding us through our wait for our armed forces to return home. And, there were a couple of compulsory shots of the actual car they are selling. It seemed the seed was planted by Chrysler’s spot in last year’s super bowl stating that Detroit (and America) was back. Other than the Millions of views those two longform spots have received on YouTube in the two days since the Super Bowl, it remains to be seen what will be done to build on them. 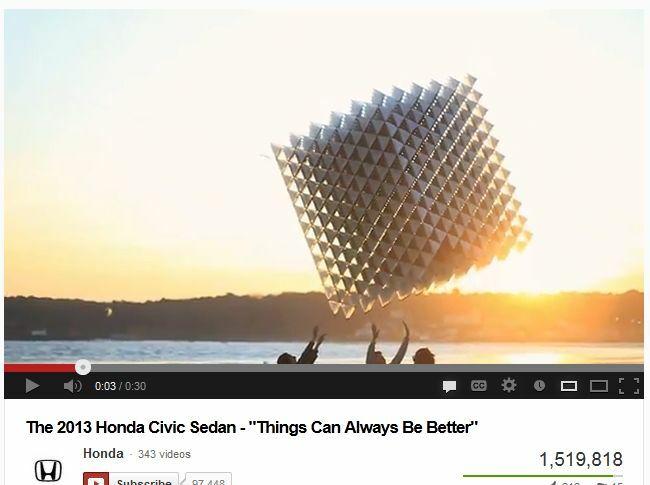 But the onslaught of inspiration has been taken to the next level by Honda and its Civic model. Tying into every big social media platform, Honda is leveraging its inspiration into a content play surrounding innovation. The social media program is called the #HondaInnovator Series and it sets off to provide more information about the innovators in its spot. With a slew of programming across Facebook, Instagram, Pinterest, Twitter and YouTube to distribute content and enable interaction, they’re hoping to also generate buzz around the 2013 Honda Civic. Though it’s not clear how many people will show up for the hour-long Tweet chats with the innovators featured in the spots, Honda will end up with a bunch of content that indirectly touches on their product. To a certain extent, the sky is the limit on where they could take this new-found content stream. Though I don’t believe its the same, it feels sort of like the moment that ESPN decided to create the X Games – but that had sports at is core. Maybe a better example was when MTV decided to air a reality TV show about kids living together – perhaps they all liked music.